At the Bra Patch, we are proud to provide one of the most extensive inventories of sports bras and fitness undergarments in North Carolina. As with all of our bras, we offer a comprehensive selection of sports bra sizing options which is simply not available anywhere else in the area. We offer sports bras in low, medium, and high-impact designs, allowing you to choose your preferred level of compression and support for exercise of any type or intensity. 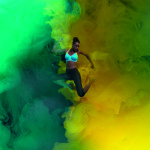 Whether you need a sports bra for running, yoga, tennis, soccer, the gym, or any other physical activity, we at the Bra Patch are here to help you find exactly what you require. Our commitment to serving hard-to-fit and plus-size women has lead us to stock sports bras in a complete array of sizing options which are simply not available anywhere else in the area. We offer sports bras with hook closures and adjustable straps, enabling the same degree of fit found in our regular bras. We also stock sports bras with built-in underwires to provide separation and a more desirable shape than can be achieved with non-underwire sports bras. As with all of our bras, our sports bra selection includes a wide range of styles, colors, and patterns ranging from the most basic to the latest in fashion. Come to the Bra Patch for all of your sports bra needs regardless of your sizing, style, and impact-level requirements.